Synopsis: Bodies are turning up around the city, each having met a uniquely gruesome demise. As the investigation proceeds, evidence points to one suspect: John Kramer, the man known as Jigsaw, who has been dead for ten years. Review: The biggest question left by this turgid attempt to reboot the Saw series is “Why”? Why wait all this time? The last entry, the now-incorrectly titled Saw 3D: The Final Chapter came out in 2010 and put a rather decent pin in the whole shebang. Why go back to the well that has long since dried up, providing no nutritional substance in plot, character, or creativity? Isn’t it obvious? This is a product from a studio (Lionsgate) desperate to find another dependable franchise to ciphon out money from the pockets of easily enticed moviegoers. Keeping their tradition of not screening these films for crictics, I was one of those audience members curious enough to venture out the week before Halloween to see how this series would get revived. The film offers nothing new to add to the mythology of John Kramer (Tobin Bell), the madman that offered a sick kind of redemption to troubled souls. Placing them in increasingly serpentine traps that were designed to have them inflict pain on themselves or others, Kramer sought to help these people that strayed back to the path of good. Too bad so many of them wound up literally in pieces along the way. As Jigsaw opens, Kramer has been gone for ten years but a new game has started that bear his calling card. The clues left behind all point to Kramer but how can a man dead and buried for a decade be running this new horror show? The red herrings abound with little logic, most of the time the cops on the case (led by Callum Keith Rennie, Fifty Shades of Grey) point to a suspect that may have looked at them sideways or on some undisclosed second-sight instinct. Medical examiner Logan Nelson (Matt Passmore) is brought in to help the police figure out the clues but it’s really his plucky assistant Eleanor Bonneville (Hannah Emily Anderson, whose character name is more memorable than her performance) that lasers in on who is responsible for the killing but not necessarily why. At the same time the experts are tracking the killer and examining mutilated bodies, we bounce back and forth to a deadly game playing out in real-time that is supposed to be feeding us clues but might just be another fake-out that this franchise has been so dastardly in introducing. The acting by all is terrible (which is pretty par for the course) but the bad performances might be easier to take if anyone (at all) was the least bit invested in what they were doing. Directed by The Spierig Brothers with little fanfare, I can only hope their next film, Winchester: The House that Ghosts Built, is a more promising endeavor. This is a puzzle that you don’t need any kind of brainpower to solve, just the willingness to turn it off as you enter the theater. Synopsis: Bodies are turning up around the city, each having met a uniquely gruesome demise. As the investigation proceeds, evidence points to one man: John Kramer. But how can this be? The man known as Jigsaw has been dead for over a decade. Thoughts: We’ve been lied to! 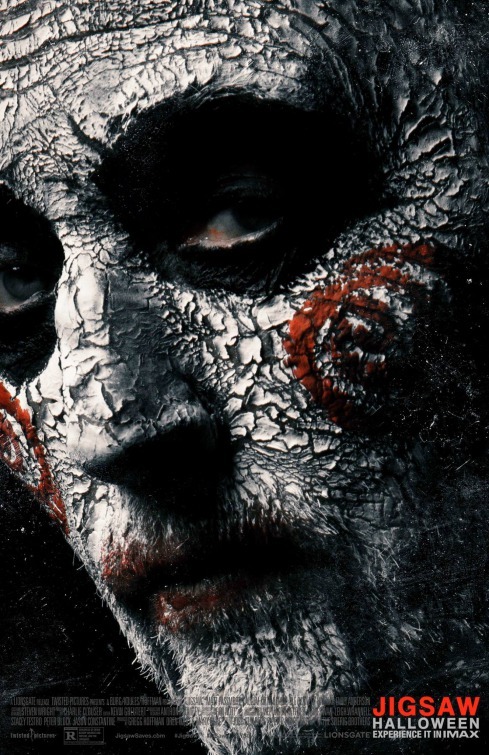 After seven films, the Saw series was said to be over and done with back in 2010. 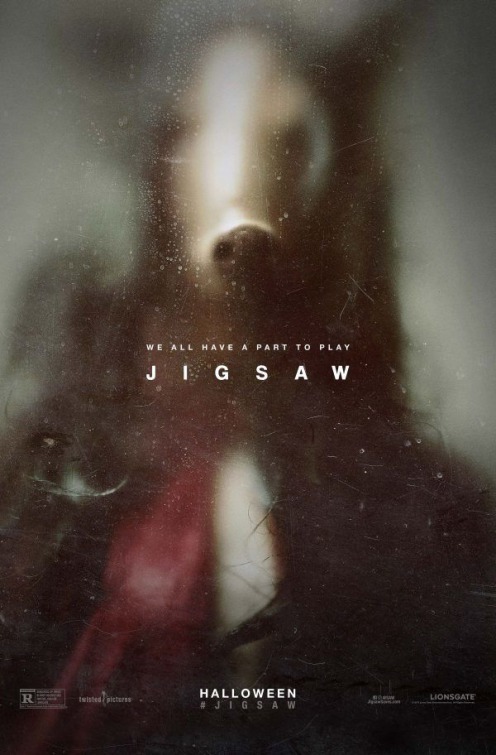 Well, it’s not the first time we’ve been told that a franchise was ending only to have greedy studio execs drum up another sequel…but why do I get the nagging feeling that Jigsaw might represent a neat little surprise for all the naysayers? It’s probably my willingness to give any horror sequel a shot in the hopes it won’t be another cheaply made retread of previous entries. I’m hopeful already seeing that Jigsaw is being directed by The Spierig Brothers who haven’t helmed any blockbusters but have made some vastly underrated pics. If you don’t believe me, do yourself a solid and seek out Predestination.